I&apos;m a scaredy cat. Heights, flying, spiders, you name it. So, you can imagine my trepidation when Scott Appleman of Rainbow Ryders told me a couple of weeks ago that I should take a ride with his team. Given that I&apos;m new to Albuquerque, my job is to promote tourism here, this is the Hot Air Ballooning Capital of the World, AND I&apos;ve never been in a balloon before, logically this seemed like a good idea. But inside, I was anxious. I woke up early so I could get to the Rainbow Ryders office by 6 a.m. I signed a waiver and met my pilot, Jim. Jim directed me to the van, along with the other passengers who would be in the balloon. I was surprised to see eight vans outside the office, each with a trailer carrying a basket and a huge bag with the balloon in it. We headed off to the launch site. 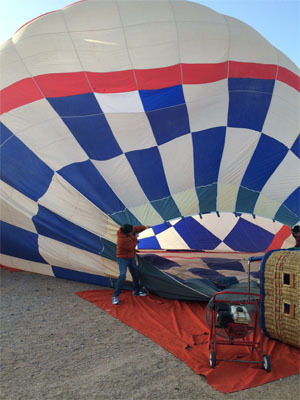 At the launch site, the pilots gathered and sent a helium balloon into the air. They all studied the way the balloon traveled and determined that we should go to another launch site instead. We spent just a few short minutes in the van, and ended up at another launch site. The pilots again sent the helium balloon into the air, watched it, discussed, and determined that this was the spot where we would launch. Jim and crew asked the men in our group to hold the balloon open while a fan filled it with air. It was a beautiful sight, with eight huge balloons filling up on the lot, all at once. When it had enough air going in, Jim started the flame. In the chill of the morning air, the heat was quite welcome. Then, it was time. Jim motioned for all of us to get into the basket. I, along with two lovely couples - one from Wisconsin and the other from New Zealand - climbed in. The rope securing us to the ground was let go, and we were off! We were the third balloon up, and it was fun to see a couple of balloons above us and a few more on the ground still inflating. The ride was incredibly peaceful and smooth. Aside from talking, the only noise you hear is the sound of the flame from time to time. The balloon is a gentle giant, and the flame sounds like a friendly dragon. This is no airplane - there is no turbulence, the balloon just rides with the breeze. 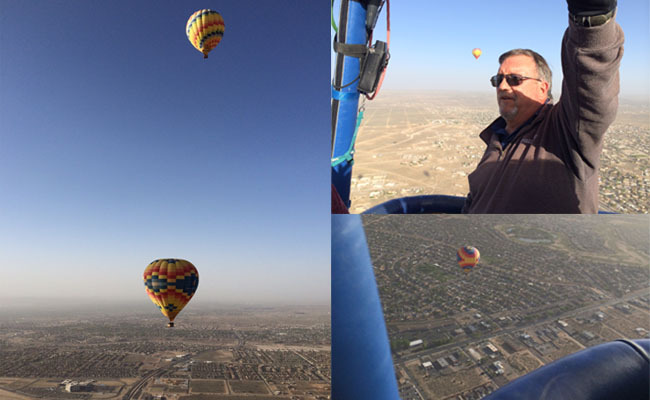 We reached heights of just over 2,000 feet, and watched the other balloons float above and below us. Even landing was part of the experience. Jim had given us instructions to crouch down and hold onto the ropes inside the basket. After a couple of soft bumps that had us all laughing, the ride was over. Seeing Albuquerque from the sky was an experience unlike any other, and one I highly recommend. After the ride, we went to a park and did a champagne toast, had a light snack, and Captain Jim presented us with our flight certificates and champagne flutes to commemorate our flight. This scaredy cat will proudly display that flight certificate in her office, and look forward to the next flight!